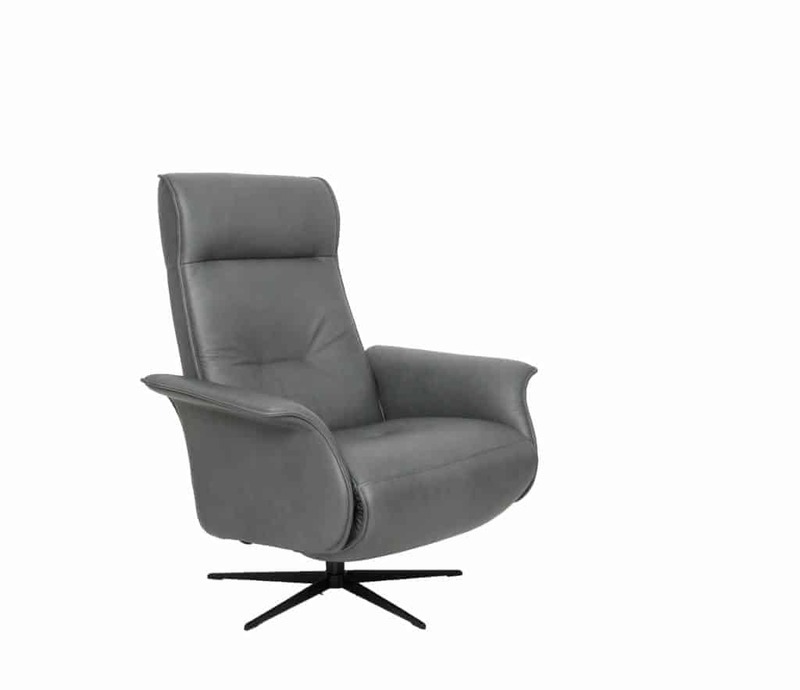 The Fjords Metro Relaxer relaxer recliner is from Fjords by Hjellegjerde, producers of the original Scandinavian leather chairs and renowned for high-end Norwegian furniture design. 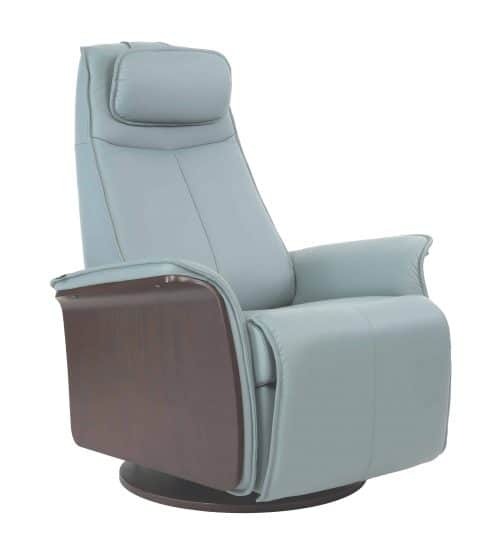 The Fjords Metro Powered Swing Relaxer is a blend of style, comfort, and quality, that is truly unique and helps it stand out in a vast world of recliner options. 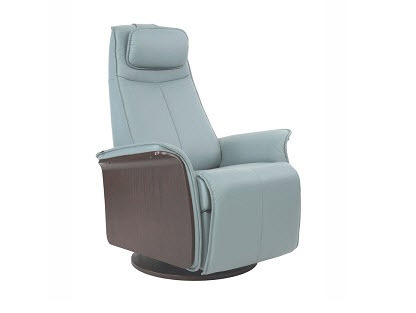 The utmost important aspect of the design of the Fjords Metro Powered Swing Relaxer is to deliver an exceptionally unique and stylish way to relax, while your neck and back are fully and comfortably supported. In fact, every Fjords Swing Relaxer has a Fjords Active Release system, which is built into the design. The Fjords Active Release system adds optimal support for your back and neck to help you truly unwind. Here are some of the key features that help make the Metro Swing Relaxer an amazing addition to any home. 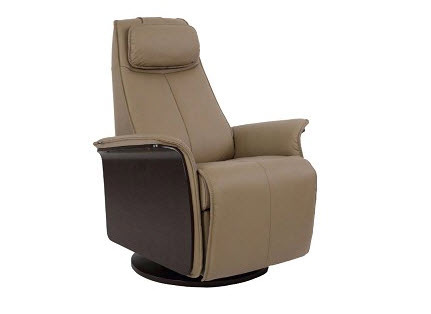 One of the most convenient is the ability to recline with a simple push of a button. As the Relaxer reclines, the seat-back moves with your body, not against it, to ensure maximum comfort and support for your neck and back. Also, the Fjords Metro is available in a small and a large size. This helps guarantee that you get a recliner that is the perfect size to fit you. Another key feature of the Fjords Metro is the ability to customize the sides of the swing Relaxer arms. Each of the armrests is covered with veneer wood. 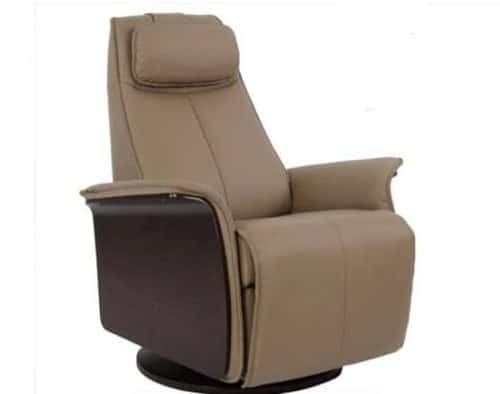 There are many wood stain colors to choose from (most are special order) which helps to ensure that your beautiful new recliner will fit with any of your room’s decor. Fjords Swing Relaxers are designed with quality as a top priority. The Ten Year Warranty brings “peace of mind” and shows that Fjords is highly confident in the durability and life of each Swing Relaxer. 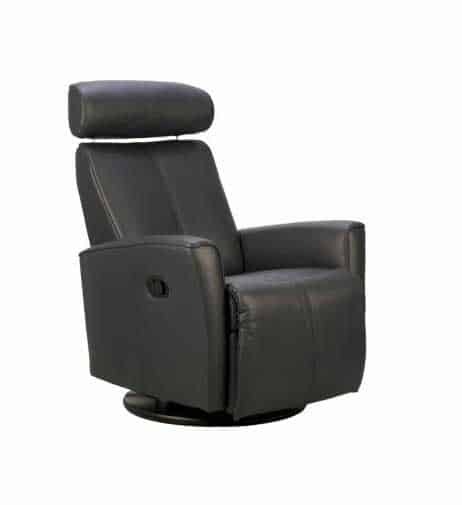 The ability to recline all the way to the true resting position with the simple push of a button. The wood stain veneer armrest sides add a splash of color and allow you to match your swing relaxer to your life. The Fjords Active Release System provides optimal Neck and Back Support. The design is quite unique and refreshing. 10-year warranty on frame. See Fjords warranty information for additional details. 170 (motorized) or 360 (manual) Degree Swivel rotation. Solid round base features eight small flat round polypropylene floor protectors around the bottom of the base. Black Base is standard on all swing relaxers, no finish options. Motorized version is 170 degree swivel. Glide lock is not compatible for motorized version.